We are confirmed for The Grand Event Center, Long Beach CA for Saturday July 16, 2016 with our ticket cost being $119.00 per person for a sit down chicken dinner. The meal will consist of a full salad and dinner rolls, Chefs choice of a chicken, starch and vegetable, and Chef's choice of dessert along with coffee (both regular and decaf) and tea (both hot and iced). There will also be a vegetarian option for anyone who may have that request. DJ Ozzie will be providing his skills, talent and music! 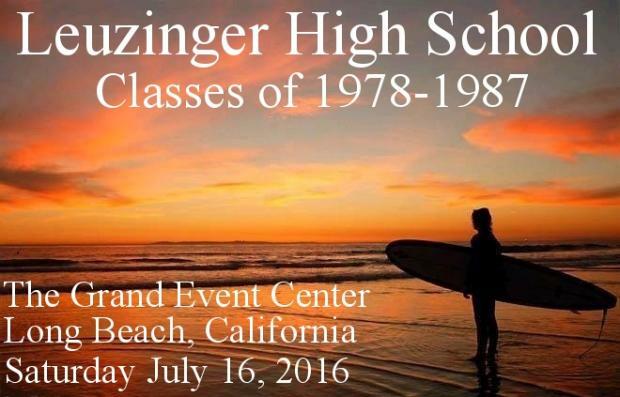 Tickets are now on sale for anyone calling into High School Reunions Customer Service @ (800) 655-7971. Our webpage on their website will be updated within 10 business days (or sooner). Once the website has been updated, you can purchase your tickets online and do your biography online. Please spread the word that no one needs to wait until they receive their invitation to purchase their ticket or to complete their biography unless they wish to do so.